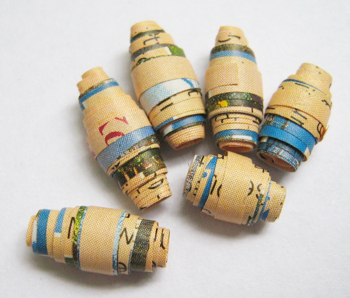 In a sense I always found paper beads great, but in another sense it always makes (made! ;-)) such a mess, so that I didn’t often made some. 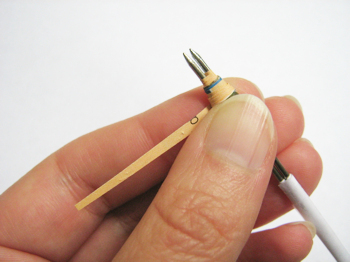 She also describes very good how to apply the glue and how to use the glue excess as varnish for the bead. 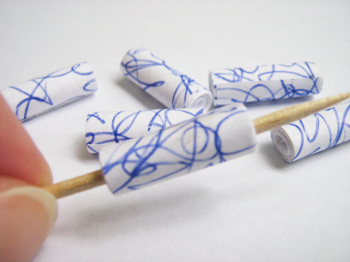 A little more research found me an instruction on how to build a self-made paper beads roller. 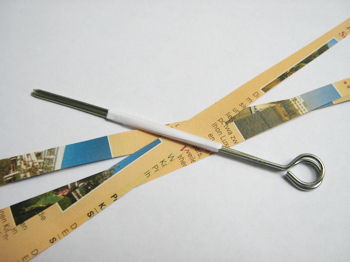 Cut your paper strips for the beads (I used a page from a travel brochure) and take two big needles, two toothpicks (they have to be smooth!) or – as I did – two little metal skewers. 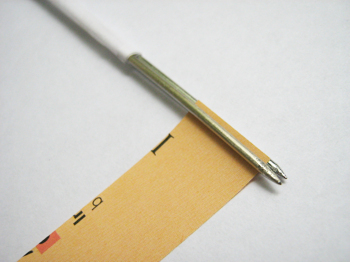 Join both needles (toothpicks, skewers…). It would be enough to wrap some tape around, but I didn’t want to become my skewers sticky after taking away the tape, therefore I wrapped a broad strip of paper around and taped that. 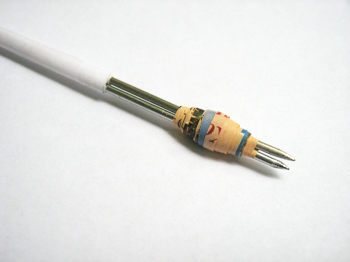 Slip the end of a paper strip between both skewers (if you use triangular ones, slip in the broad end) and begin to wrap on the bead. 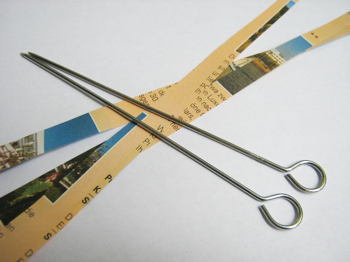 On the photo you can see the paper strip that holds together my skewers. That’s how it looks shortly before you’re finished with wrapping. 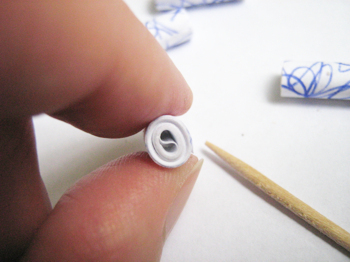 When your bead is done you can easily remove it. The hole of the bead is split into two holes because my bead roller consists of two halves. and if you want to try some other bead shapes check out the Paper University. The link doesn’t work no more, look instead for the Google image search result for ‘paper bead purse’. I love it. I’m always looking for good ideas n for simple tools. And u blew my mind. Thanks. Thanks Susann. Great idea and so so easy.